1.1 DIVA Embedded Linux Kit: what is it? 1.2 DIVA Embedded Linux Kit: what is not? 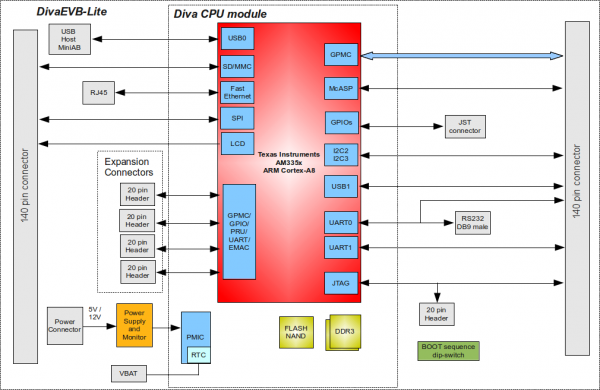 DIVA Embedded Linux Kit: what is it? build Linux applications that will run on the target. Technical documentation such hardware manuals, mechanical drawings, reference schematics, application notes etc. The documents related to the software issues help the user to quickly start configuring the bootloader and the operating system, by hiding most of the complexity of the underlying hardware. For more details about DIVA hardware characteristics, please refer to the DIVA Hardware Manual. An account for the reserved area of DAVE's website is required to access the kit contents. DIVA Embedded Linux Kit: what is not? The kit is neither a complete Linux programming guide nor a Linux Reference Guide. Internet provides lots of information, tutorials and examples about writing applications and drivers for this operating system and how to work with it from the user's point of view (for example, type “Linux programming” in your favorite search engine). As the kit is heavily based on open-source community-maintained software projects, DIVELK does not provide exhaustive documentation for these software components but it points out where to find the information on the Internet or books. For example, for the U-Boot bootloader, the kit does not list all the commands it handles but provides the link to the on-line documentation and to the public mailing list used by its community. For novice users who have no experience at all with embedded Linux systems, reading article Embedded Linux is recommended. This document describes how to run Linux on the DIVA/DIVAEVB-Lite/Carrier-board system and how to work with DIVELK version 2.0.0 and above. For novice users who have no experience at all about embedded Linux systems, reading of Building Embedded Linux Systems By Karim Yaghmour is strongly recommended. Practically speaking, the book covers all matters involved in developing software for such systems (from tool-chain organization to the most famous file systems running on top of MTD). It is not a reference guide, but it provides a complete and exhaustive overview that helps the developer save a lot of time in searching for such information on the Internet. For a brief but still exhaustive overview of the Linux and Embedded Linux world, please look at the Training and Docs sections of Free Electrons website. 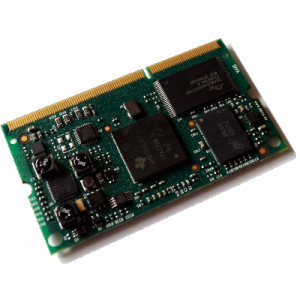 We are committed to making our products user-friendly and will help customers use our CPU modules in their systems. Technical support is delivered through email. Support requests can be sent to support-diva@dave.eu. Software upgrades are available in the restricted download area of DAVE Embedded Systems web site: http://www.dave.eu/reserved-area. An account is required to access this area (please contact support-diva@dave.eu for account requests). Please refer to our Web site at http://www.dave.eu/dave-cpu-module-am335x-diva.html for the latest product documents, utilities, drivers, Product Change Notices, Board Support Packages, Application Notes, mechanical drawings and additional tools and software. 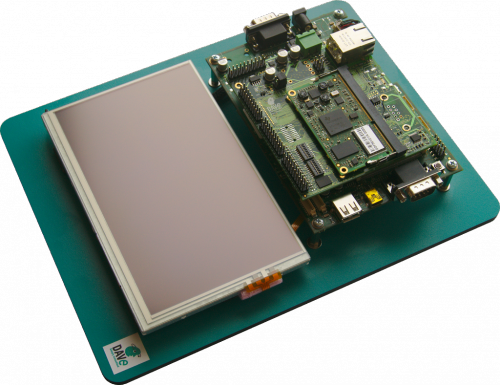 DIVA Embedded Linux Kit, in turn, is directly derived from AMSDK. Hence DIVELK documentation often refers to AMSDK resources. 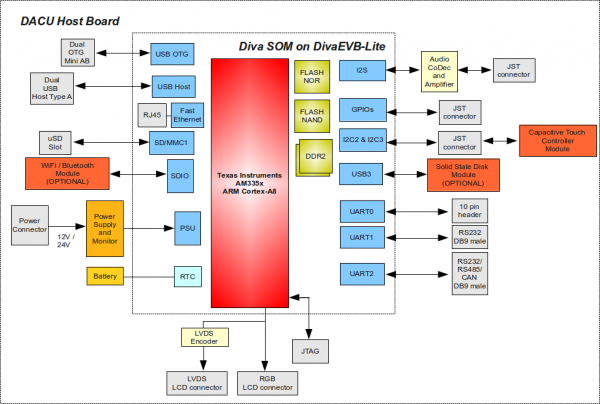 DIVAEVB-Lite is an adapter board designed to evaluate the functions of DIVA system-on-module. DIVAEVB-Lite can be plugged on the Dacu carrier board to extend the set of available interfaces. Last but not least, there are no license fees. the root file system – this file system is mounted (which means "made available", "attached") by the kernel during the boot process on the root directory (“/”). The typical developing environment for an Embedded Linux system is composed of a host machine and a target machine. The host is used by the developer to compile the code that will run on the target. In our case the target is obviously the DIVA module, while the host is assumed to be a PC running the Linux operating system. The Linux kernel running on the target can mount the root file system from different physical media. During the software development, we strongly recommend using a directory exported via NFS by the host for this purpose (see the example configuration called net_nfs). Please note that DIVELK u-boot and kernel source trees are derived from the official trees released by TI; these trees have been customized to add support for the DIVA SOM. For further information on AMSDK, please refer to Sitara SDK release notes. 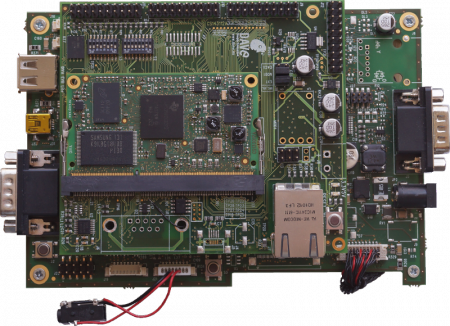 DAVE Embedded Systems adds to the latest AMSDK from Texas Instruments the customization required to support the DIVA platform. For this reason most of the documentation provided by TI remains valid for the DIVELK development kit. However, some customization is required, in particular at bootloader and linux kernel levels. It's recommended to use the latest available DIVELK version. Customer who want to update to the latest DIVELK release can send an email to support-diva@dave.eu. Please refer to Release notes for further information. This means that these components can be kept in sync and up to date with DAVE Embedded Systems repositories. with the request for the creation of a new public git account associated to your username. The support team will enable the account and send you a confirmation as soon as possible. or replace the fetch-merge process with a single git pull command. Please note that the recommended method is the fetch-merge process. For further information on Git, please refer to Git Documentation. The following figure show the typical developing environment for an Embedded Linux system: it is composed of a host machine and a target machine. The typical developing environment for an Embedded Linux system is composed of a host machine and a target machine. The host is used by the developer to (cross-)compile the code that is to run on the target. In our case the target is the DIVA CPU module, while the host is assumed to be a PC running the Linux operating system, either in a physical installation or as a virtual machine. 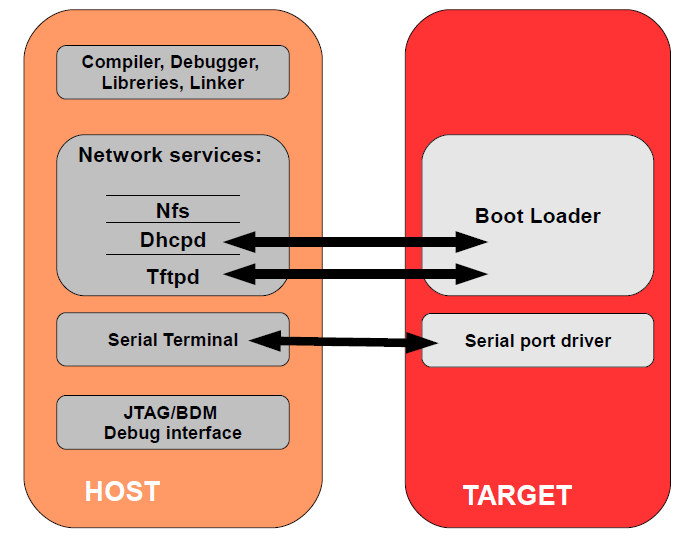 The bootloader running on the target can download the Linux kernel image through the network (TFTP), as well as the u-boot binary images (useful when an update of the bootloader is required). Moreover, the Linux kernel running on the target is able to mount the root file system from different physical media, for example from a directory exported via Network File System (NFS) by the host. This strategy (kernel image and RFS retrieved from the network) saves time during the development phase, since no flash reprogramming or removable storage (SD, usb pen drives, external disks) is required to test new versions or updates of the software components. With the term "toolchain" we refer to the set of programs that allow the building of a generic application. For applications built to run on the same platform as the tool chain, we use a native toolchain. On the contrary, for applications built to run on a target architecture different from the host architecture, we use a cross-toolchain. In this case all the tools involved in this process are lead by the “cross-” prefix. So we talk about cross-compiler, cross-toolchain and so on. The cross-toolchain used to build U-Boot and the Linux kernel is the GNU toolchain for the ARM architecture built for x86 hosts. In other words, the toolchain runs on x86 machines but generates binaries for ARM processors. As for all the software compliant to the GPL license, it is released in source code. Thus the first thing to do to set up the developing environment should be building the cross-toolchain. This is not a trivial task, it takes a lot of time and hard disk space. To avoid this tedious task, we suggest use of a pre-built toolchain as explained in the following sections. After system power-up, U-Boot prints some information about itself and about the system it is running on. Once the bootstrap sequence is completed, the prompt is printed and U-Boot is ready to accept user's commands. U-Boot manages an environment space where several variables can be stored. These variables are extremely useful to permanently save system settings (such as ethernet MAC address) and to automate boot procedures. This environment is redundantly stored in two physical sectors of boot flash memory; the default variables set is hard-coded in the source code itself. User can modify these variables and add new ones in order to create his/her own custom set of configurations. The commands used to do that are setenv and saveenv. This process allows the user to easily set up the required configuration. Once U-Boot prompt is available, it is possible to print the whole environment by issuing the command printenv. Linux kernel for Sitara processors is maintained primarily by Texas Instruments, that constantly works in close cooperation with Linux community in order to push all the released drivers into mainstream kernel. Periodically TI releases the so-called Platform Support Product (PSP for short). PSP provides updated kernel sources. Kernels released within DIVELK derive directly from PSP kernels. The Flattened Device Tree (FDT) is a data structure for describing the hardware in a system (for further information, please refer to http://elinux.org/Device_Tree). Device tree source code is stored into the arch/arm/boot/dts/ directory. The Linux kernel running on the target needs to mount a root file system. Building a root file system from scratch is definitively a complex task because several well known directories must be created and populated with a lot of files that must follow some standard rules. Again we will use pre-packaged root file systems that make this task much easier. The Yocto Project, hosted by the Linux Foundation, provides open source, high-quality infrastructure and tools to help developers create their own custom Linux distributions for any hardware architecture and across multiple market segments. The Yocto Project is intended to simplify the work of the developers, providing a set of tools and components, including a highly configurable build system, that enables users to construct their own custom distributions, targeted for specific embedded devices. It is not, itself, a Linux distribution. Rather, it is capable of producing an image for a particular embedded device without dictating the composition of the Linux distribution actually built or the hardware architecture used. The software components for the DIVA platform can be built using Yocto and the source trees released with the DIVELK 2.0.0. DAVE Embedded Systems Virtual Development Kit is a virtual machine, based on Oracle VirtualBox that allows developers to start using DAVE Embedded Systems' platform without wasting time in installing the development environment. 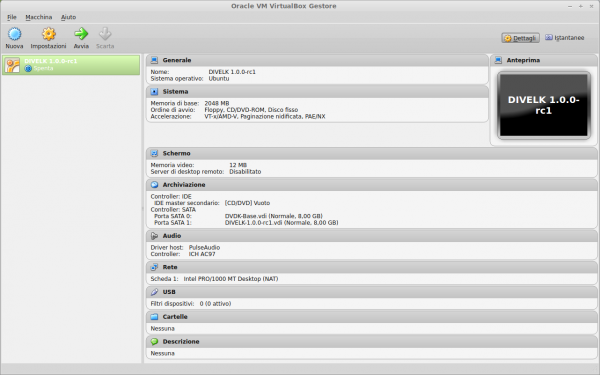 The Virtual Machine comes with all the development tools and source code, pre-configured, and requires only a minimal setup by the end user (usually only to adapt network interface to the user environment). DVDK can also be converted, easily, into a physical environment, for example to increase speed on slower machines. 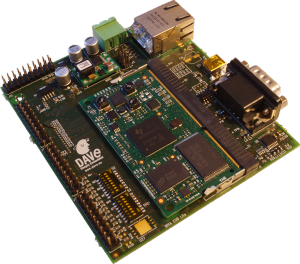 Please refer to DVDK page on DAVE Embedded Systems Developer's Wiki for further information on DVDK. 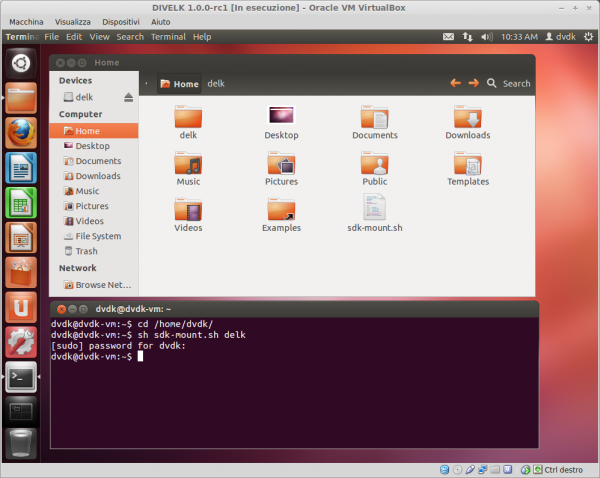 DIVELK contains all the required software and documentation to start developing Linux application on the DIVA platform. 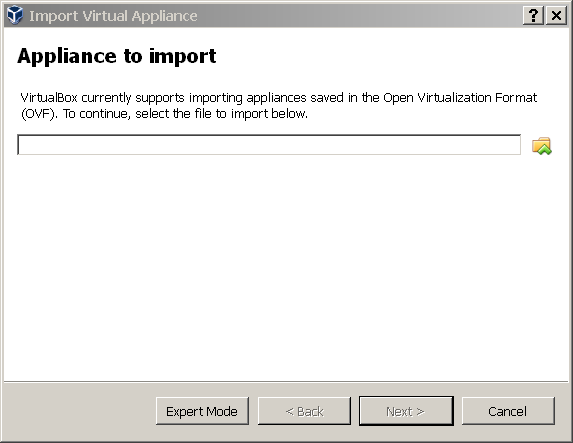 Click "Next" and on the next window click on "Import"
Once logged in, the system could suggest to update the Virtualbox Guest Additions package. You can follow the on-screen instructions to easily install the updated package. 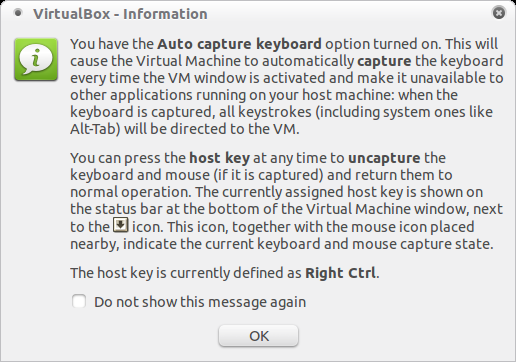 Check if your keyboard layout matches the Ubuntu keyboard settings. You can change the keyboard layout selecting System->Preferences->Keyboard from the top panel menù. The Texas Instruments Arago distribution (http://arago-project.org/wiki/index.php/Main_Page) and therefore DIVELK 2.0.0 are based on Yocto. During development, user needs to interact with the target system. This section describes the tools that must be installed and configured on the host system for this purpose. Please note that all these tools are already installed and properly configured on the virtual machine image provided with the DIVELK. One of the most useful features of a bootloader during development is the capability to download the Linux kernel from the network. 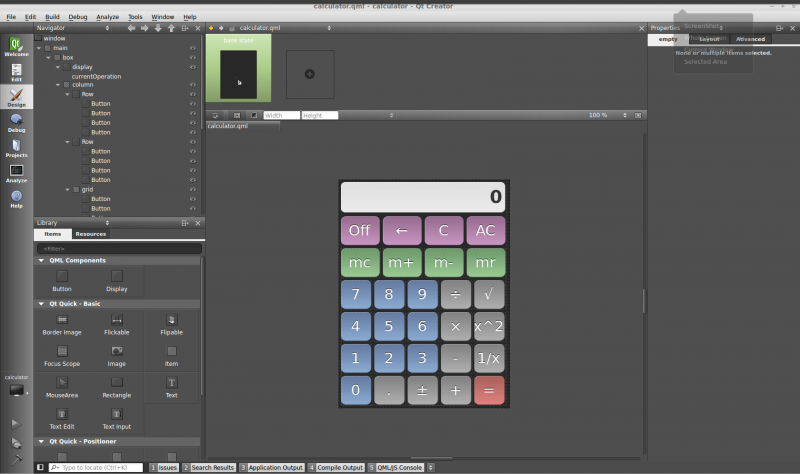 This saves a lot of time because developer doesn't have to program the image in flash every time he/she modifies it. U-Boot implements the TFTP protocol (see the tftp command), so the host system must be configured to enable the TFTP service. Installation and configuration of a TFTP server depends on the host Linux distribution. The default DVDK tftp installation has /srv/tftp as work directory. A subdirectory dedicated to the image files associated to the DIVELK (/srv/tftp/divelk) is available, but developers can add their custom subdirectories when required. One of the most important components of a Linux system is the root file system. A good development root file system provides the developer with all the useful tools that can help developers on their work. Such a root file system can become very big in size, so it's hard to store it in flash memory. User could split the file system in different parts, mounting them from different media (flash, network, usb...). But the most convenient thing is to mount the whole root file system from the network, allowing the host system and the target to share the same files. In this way, developers can quickly modify the root file system, even “on the fly” (meaning that the file system can be modified while the system is running). The most common way to setup a system like the one described is through NFS (Network File System). As for TFTP, installation and configuration depends on the host Linux distribution. The default DVDK NFS installation is configured for sharing /home/dvdk/divelk directory and all the subdirectories. 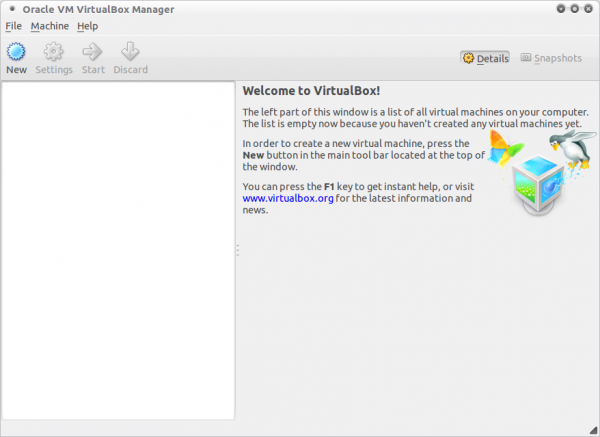 We recommend reading the VirtualBox_Network_Configuration page for additional details on the DVDK networking configuration and on how to enable NFS. To start developing software for the DIVA platform, users need a proper toolchain, which can be pre-built or built-from-scratch. Building a toolchain from scratch is not a trivial task (though using a recent build system is easier than in the past), so the recommended approach consists in using a pre-built toolchain. DIVELK provides the Linaro gnueabihf-4.7-2013.03 toolchain (GCC version is 4.7.3). DIVELK provides pre-built root file systems, that can be used during the evaluation/development phase, since they contains the software packages for working with the DIVA platform. Optionally ensure the conf/local.conf configuration file, which is found in the Build Directory, is set up how you want it. This file defines many aspects of the build environment including the target machine architecture through the MACHINE variable, the development machine's processor use through the BB_NUMBER_THREADS and PARALLEL_MAKE variables, and a centralized tarball download directory through the DL_DIR variable. Build the image using the bitbake command. If you want information on BitBake, see the BitBake User Manual. N.B. Since the DIVELK virtual machine is already configured to match all the requirements for using the Yocto build system, developers who wants to quickly build a Yocto image can directly go to section Software_Manual_(Diva)#Building the Yocto image. The resulting files (kernel, device tree and u-boot binaries, plus root file system in a .tar.gz archive) will then be available inside the build/tmp/deploy/images/diva directory. The former command selects the default DIVA configuration, while the latter builds the kernel binary image with the required u-boot header and the dtb binary. Default linux kernel configuration can be changed by using the standard menuconfig, xconfig, gconfig make target. Subsequent builds just require uImage make target to update the binary image. The former command selects the default DIVA configuration which is used to boot from SPI NOR Flash, while the latter builds the u-boot binary images. Subsequent builds just require make command, without targets, to update the binary images. Please refer to the Booting_Linux_Kernel article. [    1.375888] 0x000000000000-0x000000040000 : "MLO"
[    1.383286] 0x000000040000-0x0000000c0000 : "u-boot"
[    1.390594] 0x0000000c0000-0x000000100000 : "env1"
[    1.397868] 0x000000100000-0x000000140000 : "env2"
[    1.405253] 0x000000140000-0x000000180000 : "fdt"
[    1.412191] 0x000000180000-0x000000780000 : "kernel"
[    1.419714] 0x000000780000-0x000002000000 : "free"
[    1.977663] 0x000000000000-0x000000020000 : "SPL"
[    1.985117] 0x000000020000-0x000000040000 : "SPL.backup1"
[    1.993214] 0x000000040000-0x000000060000 : "SPL.backup2"
[    2.001160] 0x000000060000-0x000000080000 : "SPL.backup3"
[    2.009145] 0x000000080000-0x000000260000 : "u-boot"
[    2.018198] 0x000000260000-0x000000280000 : "u-boot-env"
[    2.026420] 0x000000280000-0x0000002a0000 : "fdt"
[    2.033730] 0x0000002a0000-0x0000008a0000 : "kernel"
[    2.046645] 0x0000008a0000-0x000040000000 : "rootfs"
This section describes how to quick start a DIVA system composed of a DIVA SOM plugged into the DIVAEVB-Lite and then mounted on the Dacu carrier board, provided that it is programmed according to DIVELK configuration. The SD provided with the DIVELK can be used to boot the system, since it contains a bootable partition (mmcblk0p1) and a root file system partition (mmcblk0p2). The system is configured to boot automatically, when powered up, from the SD card, loading u-boot which runs themmcboot macro, that loads the kernel and launches it with the options for mounting the root file system from the mmcblk0p2 partition. [    0.000000]  RCU restricting CPUs from NR_CPUS=2 to nr_cpu_ids=1. [    0.137533] SMP: Total of 1 processors activated. [    0.137544] CPU: All CPU(s) started in SVC mode. [    0.230756] platform mpu.1: FIXME: clock-name 'fck' DOES NOT exist in dt! [    0.232413] platform 49000000.edma: FIXME: clock-name 'fck' DOES NOT exist in dt! [    0.248489] platform 56000000.sgx: FIXME: clock-name 'fck' DOES NOT exist in dt! [    0.253079] hw-breakpoint: debug architecture 0x4 unsupported. [    0.330978] Advanced Linux Sound Architecture Driver Initialized. [    0.365759] RPC: Registered named UNIX socket transport module. [    0.365774] RPC: Registered udp transport module. [    0.365783] RPC: Registered tcp transport module. [    0.365793] RPC: Registered tcp NFSv4.1 backchannel transport module. [    0.532254] NTFS driver 2.1.30 [Flags: R/W]. [    0.532307] jffs2: version 2.2. (NAND) (SUMMARY)  �© 2001-2006 Red Hat, Inc.
[    1.576609] musb-hdrc musb-hdrc.0.auto: Falied to request rx1. [    1.608210] musb-hdrc musb-hdrc.1.auto: Falied to request rx1. [    1.842555] oprofile: using timer interrupt. [    1.916487] ThumbEE CPU extension supported. [    3.341278] mmc0: host does not support reading read-only switch. assuming write-enable. [    3.474540] VFS: Mounted root (ext3 filesystem) on device 179:2. [    9.887444] FAT-fs (mmcblk0p1): Volume was not properly unmounted. Some data may be corrupt. Please run fsck. [   10.144522] cryptodev: driver 1.6 loaded. The frequency of the CPU can be changed on the run using the Cpufreq framework (please refer to the documentation included into the linux-am33x/Documentation/cpu-freq directory of the kernel source tree). The cpufreq framework works in conjunction with the related driver & governor. Cpufreq implementation controls the Linux OPP (Operating Performance Points) adjusting the Cortex-A8 core voltages and frequencies. CPUFreq is enabled by default in the DIVA kernel configuration. Please note that OPP can be changed only using the userspace governor. If governors like ondemand is used, OPP change happens automatically based on the system load. For further details, please refer to the AM335x Linux Power Management User Guide. To evaluate the performances of the system with a specific amount of available RAM, the user can pass the mem parameter to the kernel, by setting the command line arguments in u-boot (for detailed instruction, please refer to the Change_Linux_Command_Line_Parameter_from_U-boot page). For further details, please refer to the linux-am33x/Documentation/kernel-parameters.txt file of the kernel source tree provided with the DIVELK. This page was last modified on 29 October 2018, at 08:14.